The Tata Nexon may be Tata’s first attempt to crack the sub-4 metre segment but it’s one that’s making headlines for all the right reasons. It’s the first made-in-India car to score the full 5 stars for safety in Global NCAP’s crash tests. The Tata Nexon is also the only sub-4 metre SUV to offer the option of an automatic transmission with both its petrol and diesel engine options. It rivals the Maruti Suzuki Vitara Brezza, Ford EcoSport & Mahindra XUV300. 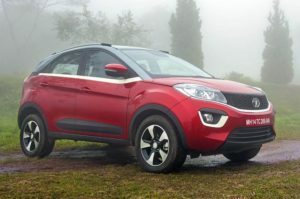 The Tata Nexon brings to the table a funky and daring design, a comfortable, feature-rich cabin, and the option of a 1.2-litre turbo-petrol or a 1.5-litre turbo-diesel engine, both available with a 6-speed manual transmission or 6-speed AMT. Does all of this come together to make for a package that’s convincing enough to be chosen over its competition? Time to get the answer! The Nexon is a great value proposition and feels like a step up for the segment. It’s a very well-rounded car, offering a good balance of safety, features, style, comfort and practicality. The diesel engine, in particular, is a major draw for the Nexon, as it offers excellent driveability and performance.While the diesel engine, with the 6-speed manual transmission or AMT is a great drive, we recommend the petrol AMT over the MT. The 3-cylinder petrol engine does have some issues with turbo-lag and the tuning of the automated manual transmission makes it more hassle-free to work around this. Check for car loan Calculator in Fincarz. Open the door and you will be welcomed by a familiar layout that we’ve seen in recent Tata cars. The steering wheel, for example, is the same from the Zest from 2014. The meters too are shared with the Tiago. Manufacturers generally tend to share parts with their other offerings to ease the cost of operations. Move aside from this and you will notice the all-new floating 6.5-inch HD touchscreen infotainment system. It is a vivid unit, easy to use and supports Bluetooth and Android Auto. Apple CarPlay integration will be done at a later stage. It isn’t retractable though. Asking for too much, aren’t we? The dashboard layout includes the premium-feeling line that runs through its length. The quality of materials used on the upper part of the dashboard though aren’t as premium. Most of the buttons are centred around the dashboard and are easy to use and understand. The cooled glovebox is large and has a tray to carry around iPads and tablets. It can be removed to liberate more space to carry a soft drink can. Tata has also added height adjustable seat belts for the front occupants. The rear passengers will feel comfortable with twin AC vents and a two-blower speed control. The boot space is pegged at 350 litres; however, the 60:40 rear split seats ensure that this capacity can be increased to an impressive 690 litres. The boot also gets a light and the loading lip too is low and hence fitting in two small suitcases doesn’t look like a problem.Fit and finish, a Tata bugbear, though hasn’t really improved from the other offerings by the manufacturer. There are many firsts for a Tata car and for the segment as well. While it isn’t clear yet if this will be offered as an accessory or as standard, Tata Motors showed us a wristband watch. This wristband eliminates the need to carry the key fob to places like the gym or at a party. Simply wear the band and press the door unlock request sensor. This band though temporarily disables the key fob. It is done to ensure that a second person cannot request entry into the car with the key fob or a duplicate. What clearly should have been added are automatic headlights as well as wipers. Speaking of which, the wiper blade doesn’t fully clean the glass surface near the driver. This doesn’t hamper vision but nevertheless could have been executed in a better fashion or by using a larger wiper blade. The sunglass holder is lined with a soft material inside; however, the access to the slot itself is a bit awkward — it didn’t accommodate my aviators. The USB slot right ahead of the gear lever is too deep and isn’t really the most ergonomic when it comes to usage. Also the headlamp levelling switch is placed on the stalk, making it a bit inconvenient while changing the beam on the move. The Nexon gets a 1.2-litre turbocharged petrol engine (110PS/170Nm) and a 1.5-litre turbocharged diesel engine (110PS/260Nm). Both engines come paired with a 6-speed manual transmission as standard and are also available with 6-speed automated manual transmissions (AMT). Both engines have been developed by Tata in-house, and while the petrol engine is a turbocharged version of the Tigor’s engine, the diesel engine is completely new. This has to be Tata’s best diesel engine till date, and it can very well be considered one of the better diesel engines in the compact car space. The engine makes 260Nm of peak torque at 1500-2700rpm and 110PS of maximum power at 3750rpm. On paper, it’s the torquiest unit in this class, and the fact that it’s not completely dead below the max torque range makes it all the more special. Shorter gearing than the petrol offers you the flexibility to drive it in 3rd gear at speeds of around 30-40kmph without the need to downshift. In our performance tests the diesel managed the 0-100 sprint in 13.25 seconds. It’s quite efficient too, returning 23.97kmpl on the highway, but in the city, with the lower gearing, it drops down to 16.8kmpl. If you are a new driver, or just tired of changing gears in bumper to bumper traffic, you can opt for the AMT. Unlike most AMTs, the transmission doesn’t change gears too often. This is made possible because of the superior torque of 260Nm available from 1500rpn onwards. It lets the SUV make overtakes in the city without shifting down, which is a good thing as the shifts aren’t particularly quick. The engagement of the first gear is a little jerky which does tend to become a little annoying over time, especially in stop-and-go traffic. But, this goes away in slow moving traffic as the shifts from second onwards are smooth. The gearbox logic does tend to get confused at times when you are going over a gradient, as the transmission can’t decide whether to downshift or not, but this too happens in limited cases and won’t bother you otherwise. Also, all the three drive modes – Eco, City and Sport are available in the AMT as well. Overall, the AMT is a good option to beat traffic blues, but only if you are absolutely tired of shifting gears, as the premium of Rs 70,200 is a little steep. The 1.2-litre, 3-cylinder petrol engine of the Tigor gets a 25PS power burst with the turbocharger on it. It makes 110PS of max power at 5000rpm and 170Nm of peak torque at 1750-4000rpm. It isn’t, however, as exciting or refined as the diesel unit. So, while the diesel engine is responsive even at low rpm, the petrol engine feels quite sluggish, and in case you’re driving with a full house, the progress gets much slower. The petrol engine hits the meat of its powerband just around 3000rpm and not 1750rpm, where max torque starts to kick in. The petrol engine with its taller gearing is not free-revving in nature and relies more on torque to pick up pace. The torque band is wide though, and the Nexon continues to build speed even above 4000rpm. It’s surprising that this engine too doesn’t feel rough or strained around its 5500rpm redline. Despite having taller gearing the petrol is quicker to the 100kmph sprint and takes just 11.64 seconds to get there. It’s more down to the fact that there is one less gear change required to reach the ton in the petrol than in the diesel car. When it comes to sipping fuel the petrol manages a very respectable 17.88kmpl on the highway and 14.02kmpl in the city. Both the petrol and diesel are currently mated to 6-speed gearboxes, with the diesel car getting slightly shorter ratios. This gives the diesel its excellent drivability but also means that there are more gears to shift through to reach the 100kmph sprint. The reason it is slower is that it isn’t the fastest-shifting gearbox. The throws are long and the shifts are not positive. In fact, during spirited driving through some twisty roads and also on our performance tests, third gear was the most difficult to slot into in either car and we all had a number of missed shifts. The Nexon gets three drives modes – Sport, Eco and City, and all the three vary the character of the engine so much so that you can actually make use of them wisely. While the Sport mode lets loose all reins, City mode smoothes out the torque delivery when the turbo kicks in at around 2000rpm and makes it much nicer to drive in the city. In Eco mode the response is dulled even more and this forces you drive in a very restrained manner. To really put this in perspective we completed the 0-100 sprint in each of the modes in the diesel and the difference between Sport (the fastest timings) and Eco mode (the slowest) was as much as 8 seconds. The Nexon gets McPherson struts up front and a twist beam setup at the rear. The ride is a nice compromise between hard and soft and because there’s not much body roll, it feels plush on the inside. It deals with potholes in the manner of bigger SUVs. So all you feel inside is a toned down thud and a little vertical movement that settles down pretty quick. The diesel Nexon is 68kg heavier than the petrol one, and the added weight results in keeping the cabin slightly more stable when going over a rough patch or at high speeds. The diesel Nexon pays the price of the added weight when it comes to handling, but not by a big margin. The difference lies in the fact that the diesel Nexon tends to understeer slightly when you get into a turn while the petrol Nexon feels sharper in comparison. Overall, the Nexon feels quite confident on the road, and stability at highway speeds is not a concern either.With discs at the front and drums at the rear, it feels confident when braking hard. But the brakes don’t offer instant bite, thus requiring you to vary the braking pressure according to the situation. Tata Nexon On-Road Price in Pune ranges from 6,63,468 to 10,87,546 for variants Nexon Revotron XE and Nexon Revotorq XZ Plus Dual Tone respectively. Tata Nexon is available in 10 variants and 5 colours. Below are details of Tata Nexon variants price in Pune. Check for Nexon price in Pune at Autozhop. The Tata Nexon is a very good effort from the manufacturer. It is sub-4m, has the good looks to boost its sales, space inside the cabin is good too and the engines also deliver decent performance. Knowing Tata’s pricing strategy, expect the Nexon petrol to start from Rs 6.5 lakh with the top-spec diesel will be priced just shy of Rs 10 lakh. At this point, it will undercut its biggest rival, the Maruti Suzuki Vitara Brezza, by a good Rs 50,000. Plus the Brezza still doesn’t come with a petrol engine. Tata Motors will launch the Nexon in India this September. The company says that they have already started taking bookings and by the time the car actually goes on sale, most of the small issues we mentioned in this review will be ironed out. Back to our question then. Will the Nexon be the next one? It will be for Tata Motors but maybe the Brezza is safe at its position for now.